The six person Expedition 56 crew — NASA astronauts Drew Feustel, Ricky Arnold and Serena Aunon-Chancellor; Russian cosmonauts Oleg Artemyev and Sergei Prokopyev; and European Space Agency astronaut Alexander Gerst — was tasked with performing experiments that studied the behavior of atoms in extreme conditions, explore microbial growth aboard the outpost and other tests to expand navigation capabilities for future travel beyond low-Earth orbit. Expedition 56 officially began at 09:16 UTC June 3, 2018, when Soyuz MS-07 undocked from the outpost's Rassvet module with Russian cosmonaut Anton Shkaplerov of Roscosmos, NASA astronaut Scott Tingle, and Japan Aerospace Exploration Agency astronaut Norishige Kanai. Those three were part of Expedition 54 and Expedition 55 with Shkaplerov serving as commander for the latter. 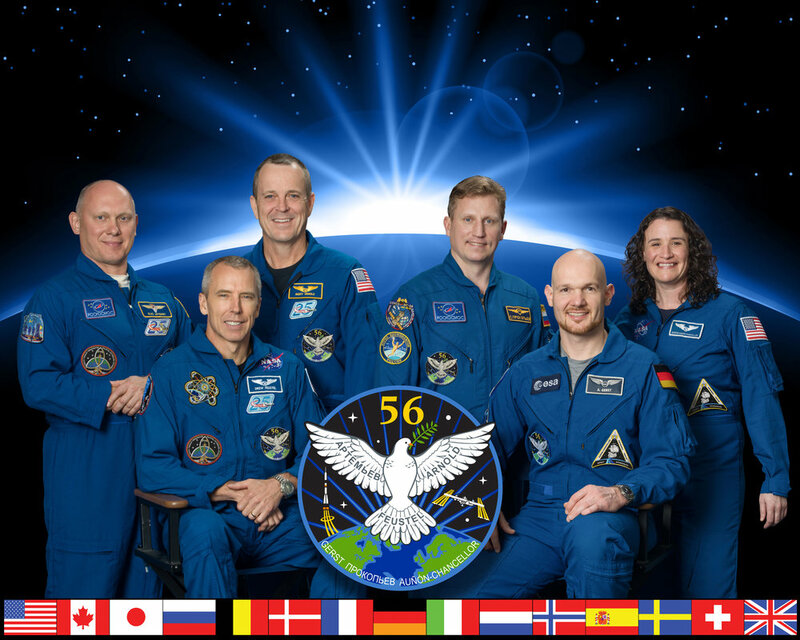 Remaining aboard ISS to form the first part of Expedition 56 were NASA astronauts Drew Feustel and Ricky Arnold and Russian cosmonaut Oleg Artemyev. Two days before undocking, Shkaplerov handed over command of the ISS to Feustel. Three days after the start of Expedition 56, Soyuz MS-09 launched with Russian cosmonaut Sergey Prokopyev, NASA astronaut Serena Aunon-Chancellor and European Space Agency astronaut Alexander Gerst to join the trio already aboard the space station. Liftoff took place at 11:12 UTC (4:12 p.m. local Kazakh time) June 6 at Baikonur Cosmodrome. Propelling the trio into orbit was a Soyuz-FG rocket. Once in orbit, the Soyuz MS-09 spacecraft spent about 34 orbits, roughly two days, catching up and rendezvousing with the ISS. Docking with the Rassvet module took place at 13:01 UTC June 8. Over the next two hours, the space between the hatches of the spacecraft and station were pressurized and checked for leaks. The hatches were open officially at 15:17 UTC while the complex was some 410 kilometers over the southern Pacific Ocean. Once on board, the now six-person crew ventured to the Zvezda service module for a traditional welcoming ceremony and conference call with their Earth-bound friends and colleagues. After that, Commander Feustel gave the fresh crew members a tour of the outpost and a safety briefing. The Soyuz MS-09 trio will stay aboard the outpost at the conclusion of Expedition 56 to form the first part of Expedition 57 in early October 2018. A mere six days after the arrival of the second part of Expedition 56, two astronauts ventured outside via the Quest airlock to perform U.S. EVA-51. The nearly seven-hour long spacewalk was performed by Feustel and Arnold and saw the installation of new cameras in preparation for upcoming commercial crew flights. At 12:06 UTC June 14, the duo switched their spacesuits from station power to suit battery power, officially marking the beginning of the spacewalk. Specifically, high-definition cameras were added to the front of the Harmony module where two docking ports (one forward and one zenith) are being prepared for the upcoming commercial crew flights. Installation required running power and data cables across the Destiny laboratory and Harmony node. Once that primary task was completed, Arnold began work to replace a camera on the starboard truss. It required the installation of a foot restraint on the robotic Canadarm2 so that he could ride the arm to his work area just below the S1 truss. Meanwhile, took a foot restraint and made his way over to the exposed facility attached to the Japanese Kibo module. His task was to close an aperture on an experiment that is set to be removed and disposed of on one of the next Dragon cargo resupply flights. The Cloud-Aerosol Transport experiment, which was designed to fire a laser to study Earth’s atmosphere, failed. This meant that it could not close its aperture door. In order to safely remove it, the door had to be manually closed by Feustel and wire-tired shut. Once the three primary tasks were finished, the two worked on several get-ahead tasks before moving back to the airlock to begin re-pressurization, concluding the spacewalk officially at 18:55 UTC—a total duration of 6 hours, 49 minutes. For the third time in about six months, SpaceX sent a Dragon capsule to resupply the ISS. This particular spacecraft launched June 29 and rendezvous with the outpost three days later on July 2. Capture took place at 10:54 UTC by the 17.6-meter Canadian-built robotic Canadarm2, which was under the control of Expedition 56 NASA astronauts Ricky Arnold and Drew Feustel at the robotics work station in the outpost's cupola window. The vehicle was grappled while the station was flying 412 kilometers over Quebec City. This particular pressure vessel visited the complex once before during the CRS-9 mission in July 2016 and is the fourth time SpaceX has reused one of its capsules. CRS-15 brought about 2,700 kilograms of supplies, hardware and experiments to the complex for the Expedition 56 crew. Among those experiments was the “Crew Interactive MObile companioN”—CIMON (pronounced “Simon”) for short. Following aborted attempts during the last two Progress cargo spacecraft missions, Russia's Progress MS-09 was sent to the space station via a new two-orbit rendezvous profile. In just three hours, 40 minutes, the spacecraft went from on the ground at its launch site in Kazakhstan to the Pirs module on the International Space Station. Liftoff from Site 31 at the Baikonur Cosmodrome took place at 21:51 UTC July 9, 2018. Once in orbit, the spacecraft began a series of automated burns to catch up with and dock to the station. Docking took place at 00:31 UTC July 10. Achieving a 2.5-orbit rendezvous isn’t easy. In fact, it requires a lot of advanced planning both on the ground and at the ISS to ensure the station’s orbital plane crosses the launch site while the outpost is at a particular location above the planet. For this mission, it required a re-boost of the station—by Progress MS-08 attached to the Zvezda service module—on June 23 to bring the station just 595 kilometers southwest of Baikonur at the time of the Soyuz 2.1a’s launch. Russian Progress and Soyuz spacecraft have regularly been utilizing a four-orbit, six-hour rendezvous profile since 2012, but even that requires precise alignments. For various reasons at the time of this cargo mission, the last time a Russian spacecraft successfully performed a sub-day launch to docking was in September 2017 during Soyuz MS-06. Progress MS-09 was packed with 2.5 metric tons of supplies. This included 530 kilograms of propellant, 52 kilograms of oxygen and air, 420 kilograms of water and 1,565 kilograms of dry cargo, according to NASA. 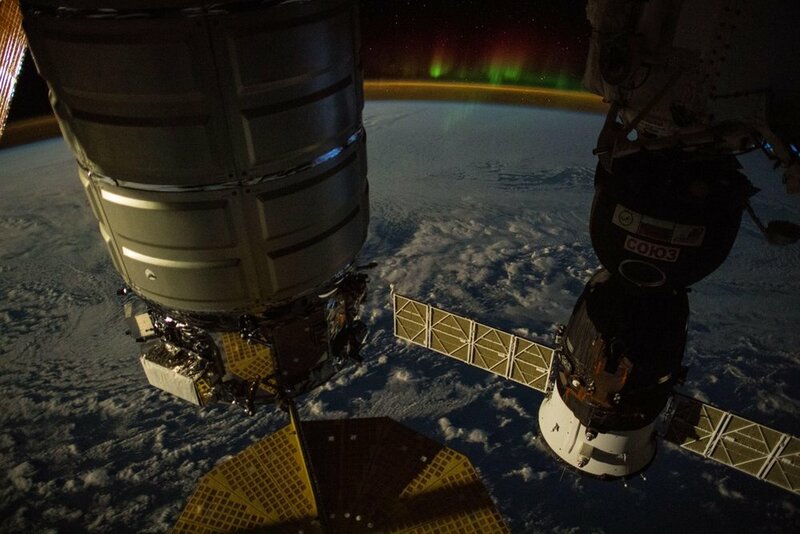 After 52 days attached to the station's Unity module, on July 15, 2018, the OA-9 Cygnus was unberthed and released to begin a secondary two-week free-flight mission. The Northrop Grumman (formerly Orbital ATK) OA-9 Cygnus was unberthed in the early-morning hours of July 15, 2018, before being released at 12:37 UTC. Upon departure the cargo ship and ISS were flying 407 kilometers above the southeastern border of Colombia. Expedition 56 flight engineers Serena Aunon-Chancellor of NASA and Alexander Gerst of the European Space Agency (two of six people residing at the outpost) were at the controls of the station’s 17.6-meter robotic Canadarm2 and commanded it to release the vehicle. This Cygnus was loaded with 3,400 kilograms of cargo on May 21, 2018, atop an Antares rocket from Wallops Island, Virginia. The crew of Expedition 55 began the process of unloading its cargo and science experiments. After the transition to Expedition 56, the craft was loaded with some 3,000 kilograms of unneeded equipment for eventual disposal by burning up over the Pacific Ocean. At 20:25 UTC July 10, Cygnus’s main engine was fired for about 50 seconds. Although brief, it still raised the altitude of about 90 meters, according to NASA. The space station flies some 400 kilometers above Earth. However, there is still a tiny amount of atmospheric particles that constantly slow the 400-metric-ton outpost down, gradually lowering its orbit. If reboosts every few months are not performed, eventually the station would fall out of the sky. While the OA-9 Cygnus’s ISS mission was complete, it didn’t perform a deorbit burn until July 30. That two-week free-flight was be used to deploy six CubeSats using an external NanoRacks deployer attached to the spacecraft. Once complete, Cygnus was commanded to deorbit over the southern Pacific Ocean to burn up safely. SpaceX’s CRS-15 Dragon returned to Earth on Aug. 3, 2018, after a month-long stay at the International Space Station. After unberthing from the Harmony module, the capsule moved away from the ISS, performed a deorbit burn and splashed down in the Pacific Ocean with cargo and research samples that were returned for further analysis. The capsule carried more than 1,700 kilograms of return cargo, including a variety of technological and biological studies, according to a NASA-issued statement. The rest of the cargo will remain aboard as SpaceX transports the vehicle to its test facility in McGregor, Texas, before being transported to the Johnson Space Center located in Houston. At 16:17 UTC Aug. 15, Artemyev and Prokopyev stepped outside the International Space Station via the airlock hatch on the Pirs docking compartment. The two Russian cosmonauts were tasked with deploying several small satellites and installing an animal migration monitor experiment. The first task was to deploy four micro satellites that were brought up on Progress MS-08 in February 2018 and Progress MS-09 in July 2018. Those craft were Tanyusha-SWSU 3 & 4 and Siriussat 1 & 2, respectively. All four were deployed by hand from the Pirs docking compartment in the opposite direction of the space station’s direction of travel, angled slightly downward. Once that was completed, the installation of the International Cooperation for Animal Research Using Space experiment, also known as “Icarus," began. Icarus is a collaborative project between the German Aerospace Center and Roscosmos and is designed to study animal migratory patterns on Earth that were tagged with GPS receivers. As such, the orbital component of this study includes an antenna and GPS hardware. According to the Max Planck Institute for Ornithology, Icarus will allow the worldwide tracking of “all kinds of animal migration flows” and will be brought into service over the coming day and weeks. It was installed on the Port side of the Zvezda service module about halfway between that side's solar array and crew compartment window. While successful, the process did not go smoothly and caused the spacewalk to get behind schedule by some 90 minutes, increasing the planned six-hour spacewalk to more than 7.5 hours. Before wrapping up the spacewalk and heading back inside, the duo retrieved several test exposure cassettes from Poisk and Pirs. Then the two made their way back inside the Pirs docking compartment and closed its hatch, officially ending the spacewalk at 00:03 UTC Aug. 16. This brought the total duration for the spacewalk to 7 hours, 46 minutes. Undocking at 02:16 UTC Aug. 23, 2018, Progress MS-08 left the ISS after a six-month stay attached to the aft port of the Zvezda service module. Some 2,700 kilograms of cargo and supplies were brought to the ISS by the spacecraft when it launched on Feb. 13, 2018, and docked to the aft port of the Zvezda service module two days later. After its cargo was unloaded, it was used as a place to store trash and unneeded equipment that will ultimately burn up in Earth’s atmosphere along with the spacecraft. With the unpiloted spacecraft's mission at the ISS completed, Roscosmos will spend the next week monitoring the vehicle as Russian mission controllers on the ground perform engineering tests. Once complete, the spacecraft will perform a deorbit burn over the Pacific Ocean for a destructive reentry. At about 23:00 UTC Aug. 29, 2018, ground controllers in Houston and Moscow detected signs of a "minute pressure leak" somewhere in the orbiting complex. According to NASA, the pressure reduction was slow enough that it was decided to allow the crew to continue sleeping and address the issue once they woke up. “When the crew was awakened at its normal hour this morning, flight controllers at Mission Control in Houston and at the Russian Mission Control Center outside Moscow began working procedures to try to determine the location of the leak,” NASA said in a statement, Aug. 30. 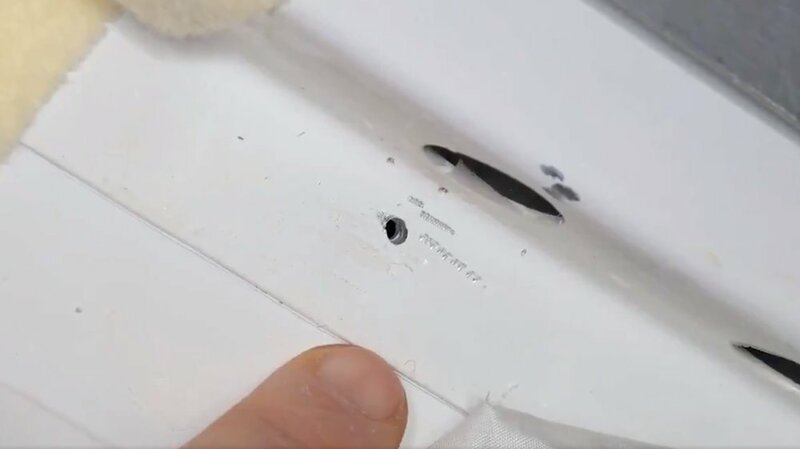 The crew worked that morning to find the hole and located it inside the orbital module of the Soyuz MS-09 spacecraft, which was docked at the Earth-facing port of the Rassvet module. As a temporary solution, the two cosmonauts placed Kapton tape (a type of polyimide film with a silicone adhesive that remains stable across a wide range of temperatures and is ideal in the space environment) over the opening, which was two millimeters in diameter, to slow the leak. At the maximum leak rate, it was estimated that the station's air reserves would have run out in about 18 days, which gave Expedition 56 plenty of time to troubleshoot a more permanent solution. 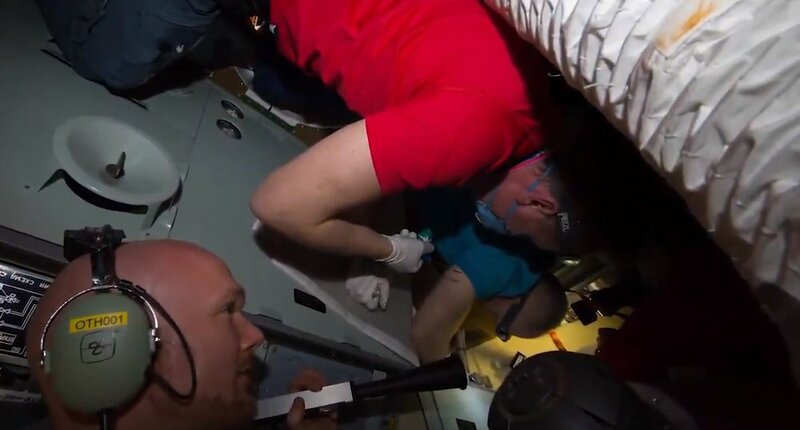 After discussions between the crew and mission control centers in Houston and Moscow, it was decided to have the cosmonauts apply an epoxy substance with medical gauze around the opening. While a bubble initially formed above the hole, the leak appeared to have stopped. Moscow instructed the crew to let it set overnight before checking it the next day. The cause of the hole was determined to be caused by human hand, likely from someone who worked on the spacecraft on the ground. On Aug. 31, NASA reported that the cabin pressure inside the ISS was holding steady and the crew continued the remainder of that day performing science experiments and preparing for the arrival of the Kounotori 7 spacecraft. Japan’s Kounotori 7 spacecraft arrived to the International Space Station to begin a two-month period attached to the outpost while crews work to unload its 6,200 kilograms of cargo. The spacecraft rendezvoused with the outpost Sept. 27, 2018. Once it was about 10 meters below the ISS, Expedition 56 Commander Feustel and Flight Engineer Aunon-Chancellor used the robotics workstation in the Cupola window to control the 17.6-meter robotic Canadarm2 to grab the autonomous cargo freighter. Capture occurred about 30 minutes earlier than planned at 11:34 UTC. 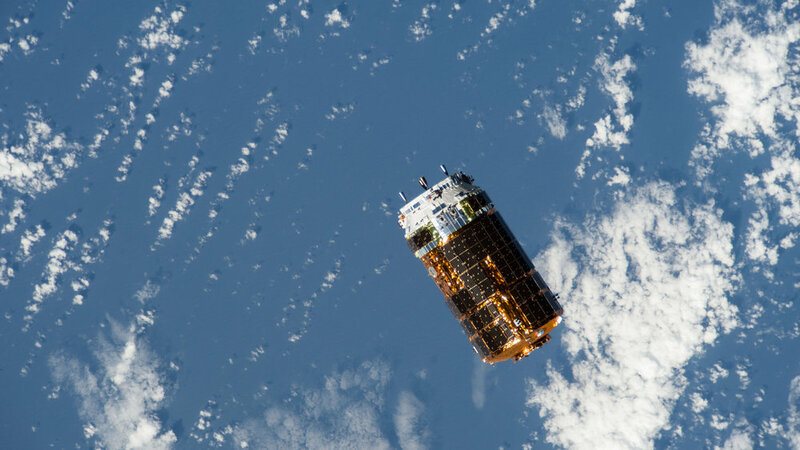 Following capture, Kounotori 7 is maneuvered to the Earth-facing port of the Harmony module for installation. Credit: NASA. Over the next several hours, ground teams remotely controlled Canadarm2 to maneuver the spacecraft to the Earth-facing port of the Harmony module where it was berthed at around 14:09 UTC. In addition to the 4,300 kilograms of pressurized cargo, the Unpressurized Logistic Carrier carries six lithium-ion batteries to be used to replace some of the existing nickel-hydrogen batteries on the exterior of the outpost. This is a continuation of the multi-mission process that began with the Kounotori 6 flight in early 2017. At least two spacewalks will be required to replace the old hardware with the new upgrades. These were initially scheduled to be performed by members of Expedition 56. However, the various delays in the launch of Kounotori 7 necessitated these to be manifested for Expedition 57 as one of the original spacewalkers, Feustel, was slated to return to Earth Oct. 4. He returned in Soyuz MS-08 alongside two other crew members—Arnold and Artemyev. At 07:57 UTC Oct. 4, 2018, Soyuz MS-08 undocked. Leaving were Artemyev, Feustel and Arnold. They left behind Prokopyev, Serena Aunon-Chancellor and Gerst to form the first part of Expedition 57. Feustel, who was commander of Expedition 56, handed over command of the space station to Gerst the day before he left. Upon undocking from the Poisk module, the spacecraft performed a full fly around of the space station, something that had not been done since the end of the space shuttle program in 2011. This was done to get views of the outpost in advance of the 20th anniversary of the first hardware launched in 1998. The fly around was completed at about 08:19 UTC. After that, the Soyuz made its final departure burn to begin moving away from the outpost. A deorbit burn is occurred at 10:51 UTC with a landing in Kazakhstan just under an hour later at 11:44 UTC. Two Russian cosmonauts stepped outside the International Space Station for more than 7.5 hours to deploy several small satellites and install an experiment designed to monitor animal migration. Expedition 56 flight engineers Oleg Artemyev and Sergey Prokopyev were tasked with Russian EVA 45, which officially began at 16:17 UTC Aug. 15, 2018, when the Pirs docking compartment's airlock hatch was opened. The Northrop Grumman (formerly Orbital ATK) OA-9 Cygnus was unberthed in the early-morning hours of July 15, 2018, before being released at 8:37 a.m. EDT (12:37 GMT). Capture took place at 6:54 a.m. EDT (10:54 GMT) by the 17.6-meter Canadian-built robotic Canadarm2, which was under the control of Expedition 56 NASA astronauts Ricky Arnold and Drew Feustel at the robotics work station in the station’s cupola window. The primary task for this particular extravehicular activity was to install high-definition cameras to provide enhanced views during the docking of commercial crew spacecraft. Flying to space to be part of the space station’s in-progress Expedition 56 is Russian cosmonaut Sergey Prokopyev, NASA astronaut Serena Aunon-Chancellor and European Space Agency astronaut Alexander Gerst.